You'll find our "Condo Video Tour" under Photos (it's the 3rd image to click on) which shows you how nice this condo looks & the Oceanfront view. Two bedroom, two bath, oceanfront condo: gorgeous ocean views are amplified by mirrors and invite the dramatic beauty of Hawaii into the comforts of relaxing at home. This non-smoking condo is excellent for families or two couples. Menehune Shores is a peaceful, oceanfront condo on the ground floor close to the calm sparkling bay of North Kihei. Your patio overlooks the seashore, grassy slopes and over the ocean, along with a distant island. You will often see spectacular wind surfing and fantastic, dramatic sunsets. Humpback whales can often be seen from the condo December through April. In addition to this exclusive serene ocean view, the unit contains ceiling fans in each room, a fully remodeled kitchen and a washer/dryer in the unit for convenience. Menehune Shores is steps from the beach. There are no roads or buildings in the way of the gorgeous ocean view. The beach is calm like the bay, the water is shallow, great views, beautiful sunsets, and perfect for walks. This beach is secluded; you'll not see a lot of people. I am an author of seven books on acupressure, which uses the same points as acupuncture, but I teach how to relieve stress and pain with your hands instead of needles. My wife Barbara and I love Maui. 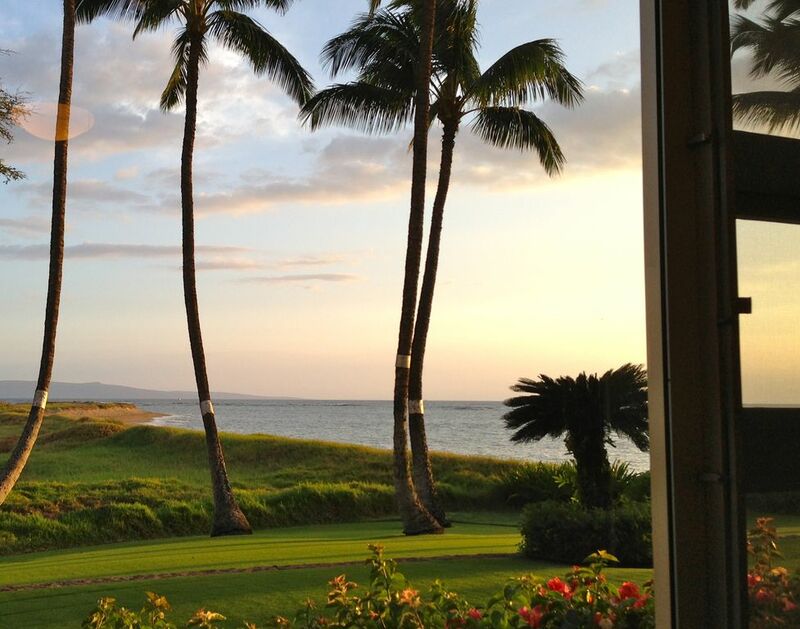 We want our guests to fully enjoy Maui's beauty. I know Maui like the palm of my hand, and offer to give guests detailed guidance to find wonderful places and great restaurants. We go out of our way to make our condos especially nice. For instance, we pay extra to have Hope host all our units. Hope does a fabulous job making sure that everything in the condo is clean and our guests have what they need. She is known to go out of her way to get our guests what they need and she does it from the heart with aloha. I fell in love with Maui in 1983 and vowed to always return. I actually wrote most of my books on this island, which fills me with inspiration. I have always been gifted to have an eye for places and people who have potential for beauty and greatness. This is how I created and developed my healing school for over 32 years, and its also how I chose to buy this vacation rental. When I enter the condo, I always get a overwhelming sense of peacefulness and a natural high from looking at the ocean view. This condo is positioned in a wonderful place, with a view that's straight down the beach. Its protected by the wind and the sun - the location is rather amazing to be steps from the beach. The Menehune Shores building is curved like a horseshoe. Each condo has a very different location, feel, and faces a different angle. We are far enough away from the road, so you don't hear any traffic. We are on the other side of the pool and restaurant which makes it so much quieter and you do not get the smells of the restaurant. I have been in units that are facing the ocean, which you would think would be better. However, these units actually face right into the harsh afternoon sun. Also, when I looked at the view, straight out to sea, I felt like I was on a boat. Seeing the coast line in our condo and how the gentle waves wash up to the beach is a picture I love to see. Our condo is unique because of the beautiful oceanfront view, which is 'steps from the beach'. Its in the perfect location, facing south west with a wonderful view of palm trees, beach, ocean, and islands in the distance. Plus, our comfortable condo is protected by the sun and wind in afternoons. For a vacation - its ideal. Plenty of free parking. During the high season, you only have a permit for one vehicle. The parking is very convenient. Microwave is built in above the stove to save room in our remodeled kitchen. 3 Flat TVs: one in each bedroom and one new flat TV in the living room. Glance above the TV screen and you'll have a beautiful mirrored oceanfront view. Menehune Shores has a Solar Heated Pool” rather than a “Heated Pool”. The pool temperature may be cooler on overcast days, particularly if there have been a few consecutive cloudy days. Microwave, Rice Cooker, Queen Size Sofa bed in Living Room, Deluxe Swimming Pool (shared), Shuffle Board, Several BBQ Grills on the roof top with 360 degree view of the whole island. Security screen door. Most beautiful beaches in the world, ocean coastline, swimming, finest golfing, scenic day trips like to the rain forest, snorkeling trips, upcountry land, fabulous wind surfing, and gorgeous sunsets on the beach.